May - 01 | By: Oregon Film | one comment. The feature-length film, made in Southern Oregon and starring two-time Academy Award nominee Shirley Knight and screen legend Tom Skerritt, opened on Friday, May 23rd at Coming Attractions Theatres in Ashland, Grants Pass, and Crescent City, CA. The film opened in Southern California theaters and across the nation in early May. Positive reviews from top industry trade magazines Variety and The Hollywood Reporter confirmed what festival audiences experienced during its award-winning festival run over the past year: “Redwood Highway” is a solid piece of filmmaking with strong performances, writing and direction. 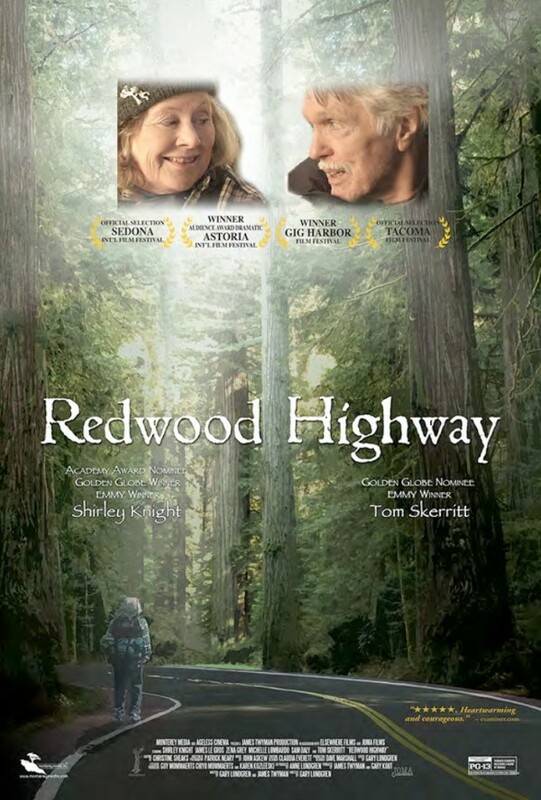 “Redwood Highway” follows the character of Marie Vaughn (Shirley Knight) who decides to sneak away from the senior community where she lives in Grants Pass, and walk over 80 miles to the coast to attend her granddaughter’s wedding. Along the way she must confront the demons of her past, including haunting memories of her former husband. Marie meets characters like a kind woodworker expertly played by Tom Skerritt, and a helpful bar owner played by Michelle Lombardo. Overcoming both odds and blisters, Marie proves that you’re never too old to have a great adventure, and heal your life. Exhibiting real Hollywood production values, “Redwood Highway” is actually a true Southern Oregon production; much of the crew and cast hail from the region, and in addition to being shot on the historic Route 199, many locations throughout Ashland, Grants Pass, Cave Junction and more were utilized. Shirley Knight’s home at the beginning of the film is the Mountain Meadows active retirement community in Ashland, and the movie opens with her enjoying a walk through downtown Grants Pass where the retirement community supposedly is. She later visits Lake Selmac and the Sportman’s Tavern in Cave Junction on her way to the coast. The legendary “It’s A Burl” shop is run by Tom Skerritt, and even the Great Cats World Park makes an appearance. Its a greatest hits of the Redwood Highway. The real Josephine County Search and Rescue team also make a big appearance in the film, as does the Classic Car Club of Southern Oregon. Local actors from the Oregon Shakespeare Festival include Catherine Coulson, Danforth Comins, Brent Hinkley, Barret O’Brien and J.P. Phillips. Gary Kout, a producer on the film and the Executive Director of Southern Oregon Film and Television, is very proud of the level of work coming out of Southern Oregon. “The high-level skills of the local crew, the brilliance of our local actors, the beauty of our locations and the film-friendly attitude in Southern Oregon, all contribute to a robust and growing environment for making all types of media, not the least of which are theatrical quality feature films.” In fact, those attributes of the local industry helped propel Ashland to the #2 Top Town spot on MovieMaker magazine’s Best Places to Live and Work as a Moviemaker 2014 list. After winning several best film awards at indie festivals, “Redwood Highway” is getting its share of attention in Hollywood, and the director and producers of the film have strong reason to believe their film might start a whole movement, as it focuses attention on the largest, most underserved audience in the world – people over 50. For decades boomers and senior citizens have been largely ignored by the film industry, but now that they represent the largest demographic in the country, their time has finally come. “It’s hard to believe that 45% of the population would be ignored at the box office,” James Twyman, the producer and co-screenwriter of “Redwood Highway” said. “Today most films are made for people under twenty-five. Interest in storydriven films with a protagonist over the age of sixty are rare. The reason is simple – the executives who are making decisions don’t believe older people go to the movies in big enough numbers. We intend to change that with “Redwood Highway”.” Twyman has launched Ageless Cinema to make films specifically to meet that need. Other veteran actors, like Tom Skerritt and James Le Gros (“Drugstore Cowboy”, “Justice”), received similar high praise in this and other reviews and fill in the spaces wonderfully, while newer faces like Zena Grey (“House”) and Michelle Lombardo (“Californication”) bring nuanced performances and texture that helps the film turn the corner from fun to profound. Director and co-screenwriter Gary Lundgren, producer and co-screenwriter James Twyman, producer Gary Kout, co-producer Anne Lundgren, as well as others from the local “Redwood Highway” cast and crew will be on hand to answer questions at special screenings in both Ashland and Grants Pass, including a benefit screening for Josephine County Search and Rescue, which played a helpful role to the production. Become a fan on the film’s Facebook page at facebook.com/RedwoodHighwayMovie. For more information about the special screenings, visit www.filmsouthernoregon.org.